« Help Us Choose an Authors Photo: Vote for Your Favorite? OpenView’s studio space, overlooking Fort Point Channel, is both stunning and inspiring. With its sound booths, video studio, radio talk-show setup, and audio equipment that is so sensitive I swear it could capture the sound of hair growing, the OpenView space is a kind of Nirvana for content creators like us. And so after we finished up Joe’s project, we spontaneously recorded an unplanned, unscripted podcast to get Joe’s thoughts on content, marketing, and to answer the question: Can any company benefit from a content marketing strategy? Even a really silly, simple one? Even a ridiculous one? Like… say…. 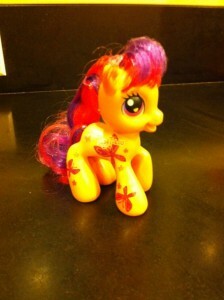 Scootaloo? 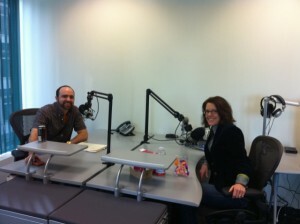 If content marketing had a superhero, it would be Joe Pulizzi. 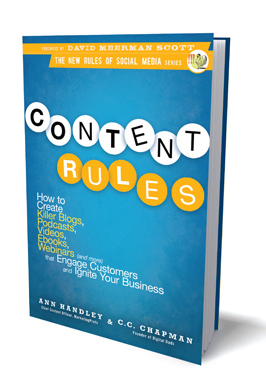 He’s been championing the power of content longer than anyone, and his 2009 book Get Content, Get Customers (McGraw-Hill) is a kind of field guide to the idea of content marketing, and perhaps the best book you should read before you read Content Rules. He’s also a prolific blogger, passionate speaker, and hard-working entrepreneur and publisher. It sounds like piling on to say he’s also a warm and personable soul… but there you go. 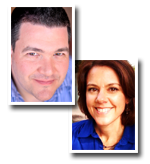 Listen in while Joe and I riff on content, storytelling, and Scootaloo’s very own My Little Content Marketing Strategy. Listen the the podcast here. The best kind of content converts pixels and sound to something meaningful that drives behavior and action. Does your brand have to tell a story? Umm, yes. The key to brand storytelling isn’t about telling fairytales or fables; it’s about telling a true story well. Ann Handley shares the rest reason she loves her birthday quite as much as she does. Where might you start building a content strategy for a plastic pony? What can My Little Pony learn from Lego, Club Penguin, and iCarly? Big thanks to OpenView Labs for hosting us, and a special shout to producer Corey O’Loughlin. This entry was posted on Thursday, November 11th, 2010 at 9:26 am	and is filed under Interviews. You can follow any responses to this entry through the RSS 2.0 feed. You can leave a response, or trackback from your own site.